She won't take it as a compliment. 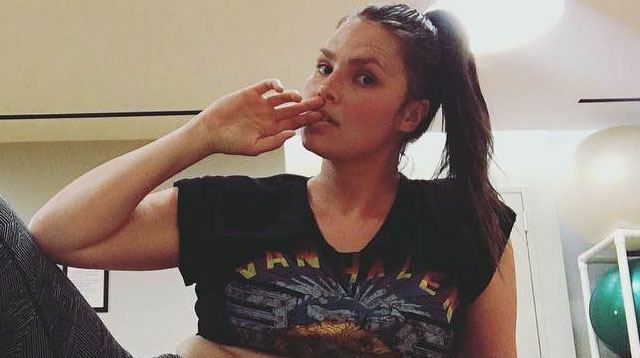 Candice Huffine, a body positivity advocate and plus-size model, doesn't want to be told she looks skinny—and if you do comment on her size, she sure as hell won't thank you. On Instagram, Candice recently shared a photo of her gym shirt hiked up to reveal her belly rolls, along with a passage from her year-old diary entry that questions why anyone would thank a person who uses "skinny" as a compliment. "It's always about size, not ability," she points out. "How come people don't ever say 'You look so fit,' 'Wow, you are so strong,' or 'You run so fast and far now!'?!" To be clear, it's not that Candice hates skinny people or even that she worries whether losing weight could jeopardize her plus-size modeling career. (That concern doesn't faze her.) Rather, Candice notes that in the past, shedding pounds hasn't made her particularly happy: "In my experience, the times I've slimmed down the most have been preceded by stress, a break up, lack of self-care, something traumatic," she wrote. Meanwhile, fitness make Candice feel unstoppable. Now that the model is training for the Boston Marathon, she's in the best shape of her life and feeling stellar—tummy rolls, be damned. "There's no perfect body," she wrote in her caption. "The one you have right now is amazing. Let it lead you to perfect days, finish lines, happy times, and fun. Take in compliments that inspire you, and give ones that empower." It's advice that could make everyone a winner.